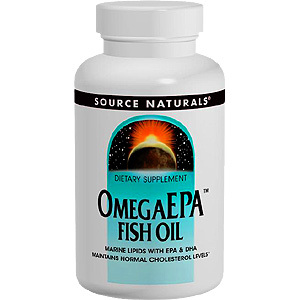 OmegaEPA is an excellent source of fish oils, rich in omega-3 fatty acids. Omega-3's have been the subject of intensive research, due to repeated observations that people whose diets are high in fatty fish tend to be healthier than other populations. The most important omega-3 fatty acids are EPA and DHA. Preliminary scientific evidence suggests EPA may help maintain cholesterol levels already in the normal range when consumed as part of a low-fat and low-cholesterol dietary program. DHA is an important component of brain tissue. Contains no yeast, dairy, egg, gluten, corn, or wheat. Contains no sugar, starch, salt, or artificial color, flavor or fragrance. Warning: If you are pregnant or breastfeeding, consult your health care professional before using. Calories 10, Calories from fat 10, Total Fat 1 g, EPA (eicosapentaenoic acid) 180 mg, DHA (docosahexaenoic acid) 120 mg.
Other Ingredients: Fish oil, gelatin (capsule), glycerin, water and vitamin E (d-alpha tocopheryl). 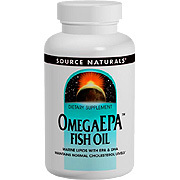 OmegaEPA Fish Oil 1000mg is shipped in a discrete, unmarked package. Orders are processed immediately and usually take about 3 to 5 working days to be received. We do ask that you try it for 2 to 3 weeks to feel the full effects. Any information received is used only for order processing and shipping purposes. Your information, such as e-mail address, will never be disclosed to a third party.